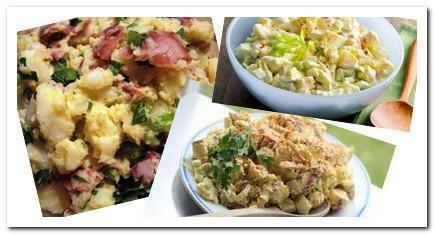 Potato and egg salad is simple and convenient. The main ingredients are almost always available in every kitchen. It is great for a picnic or gathering, serve it with bread, pasta or snacks. It is always a good side dish for any meals. Place potatoes in a medium saucepan, cover potatoes with cold water. Add salt and bring to a boil, turn the heat down to simmer. Cook until potatoes are tender and easily pierced with a fork, approximately 20 minutes. Drain, place potatoes in cool water, after a few minutes when the potatoes are cool enough to handle, peel and cut into small cubes. Heat cooking oil in a skillet, saute bacon with low heat until cooked, about 3 - 5 minutes. Drain on paper towels and set aside for later use. In a large bowl, combine potatoes, eggs, onions, mayonnaise, yellow mustard, honey, black pepper. Mix well. Serve under room temperature or chill in refrigerator. Before serving, add bacon and coriander, toss gently.